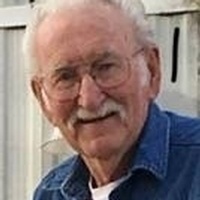 Billy Morse, 87, of Voss passed away Sunday, February 3, 2019 in the loving arms of his wife, Linda at their home. He was born May 6, 1931 to Luther and Verba (Furr) Morse in Point, Texas. Billy was an avid outdoorsman who loved to fish and hunt. He is preceded in death by his parents; a sister, Juanita Cunniff; and brothers, Carrol, Gene, and Gerald Morse. Billy is survived by his wife, Linda; daughters, Bobbie DeAlva and Sandra Godfrey; sons, Walter, Eddie, and Derek Morse; sisters, Rita Swinea and Paulette Brooks; best friend/son, Paul Bess; fifteen grandchildren; twenty-four great-children; seven great-great-grandchildren; and numerous nieces and nephews. Billy wished to be cremated, therefore, there will be no viewing. A memorial service will be held at 11:00 am Thursday at Lange Funeral Home Chapel. Bobby Maxie, Paul Bess, Jerry Chick, Roy Bolen, Joe Jackson, and Dano Jackson will serve as honorary pallbearers.